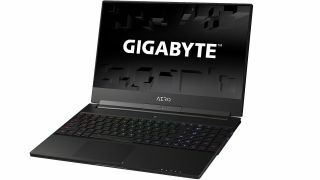 The Black Friday deals fever continues - now through Saturday, save a ridiculous $500 off an excellent 15.6' inch gaming laptop from Gigabyte, the Aero 15X, now $1,749 at Newegg. Powered by Nvidia's thin, efficient 1070 Max-Q laptop GPU tech, which packs desktop power into laptop form factors, the Aero 15X is the best laptop Black Friday deal we've seen yet. It's also loaded with a Core i7-8750H processor to easily shoulder your office workload, 16 GB of DDR4, and a 512 GB NVMe SSD. It'll easily run 2018's impressive batch of PC games at mid to high settings on its attractive 1080 144hz display, and with a battery life approaching ten hours it'll stay powered up through even long trips or your workday and commute. Check out our full review at our sister site, PC Gamer, or follow the link below to get one now before the deal expires on Saturday. This is one of the best gaming laptops available in this price range, and getting $500 off the MSRP makes it a must-buy for anyone laptop shopping this holiday season. Even given that it's often available for sale closer to the $2,000 mark, you're still shaving $200 or more off the price. And if you're looking to find some other amazing sales, pop over to our Black Friday game deals hub for a list of all the hottest discount goodies, constantly updated throughout the next couple weeks.